Healthy beverages, cold or hot, are powerful source of all natural nutrients with added benefit of burning body fat in many cases. Water is one of the best drink you can ever have and lose weight without even realizing. The drinks listed here are all can be easily prepared at home as all the ingredients can be purchased at your local grocery store. In addition to these drinks, you may also try Yerba Mate tea for weight loss. You might be surprised to see iced cold water as the first amazing drink to lose body fat. 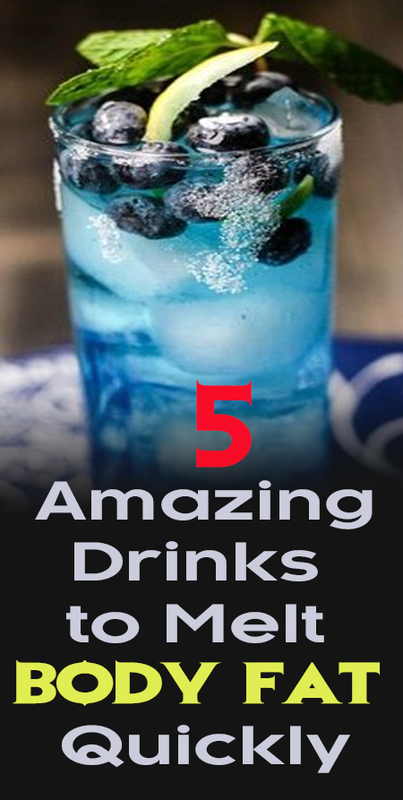 You will be surprised to know that you can burn up to an extra 100 calories per day drinking ice cold water. What that means is that you can lose an extra 10 pounds a year just by drinking iced cold water. When you drink iced cold water, your body needs to burn calories to warm up the water to bring it to your body temperature. The added advantage of drinking water before meals is that you eat less and hence lose body fat faster. Iced cold water is one body fat buster that can help you achieve your goal of slimmer body much faster than you think. Lemon water is one of the most used drink to lose weight and I have been hearing about it since my childhood. You can add juice of one small lemon into a half glass of warm water to prepare the lemon water. You must drink it as the first thing in the morning to maximize its benefits. The warm water intake in the morning helps to flush your digestive system and rehydrate the body. The lemon juice can help stimulate production of proper stomach acid and bile by stimulating the liver. Switching your regular tea with green tea can also make a difference when it comes to losing weight. Add three to five cups of green tea to your daily food intake to help your body burn 35-to-43% more fat daily. Green tea assist your body to flush out excess water weight due to its diuretic nature. Additionally it has caffeine which increases fat burning metabolism. You can use any type of green tea, either tea bags or lose tea leaves, to prepare your cup of green tea. If you feel that you will be unable to drink 3-5 cups of green tea daily, then you can consider taking green tea supplements as well as replacement. This drink can work wonders to reduce your waistline and needs only three ingredients. You need to add 2 tablespoon of apple cider vinegar, 1 full cup of grapefruit juice and a teaspoon of honey into a blender to mix all the ingredients. It is better to have the this juice before lunch and dinner for maximum benefits. The ingredients required for this drink include one cup of finely diced melon, 1 pear, 1 cucumber, 1 lemon and half tablespoon of fresh ginger. Firstly you should squeeze the juice from all the citrus fruits like orange, pear and lemon. Then add the other ingredients into a blender to blend all the ingredients into juice. You can also add mint leaves to garnish the drink. This tasty drink will help you reduce your waistline.